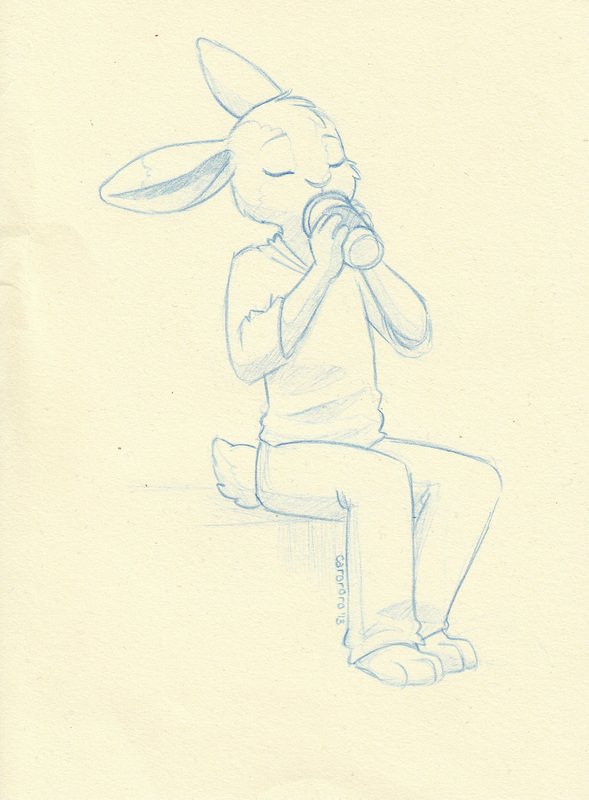 A small rabbit who enjoys coffee, art, and tight-fitting shirts. Somewhat reserved, possibly a bit pervy in secret. He rarely speaks. Coffee, clean clothes, organization, art/painting. Slim boring body, little girly hands. Form-fitting shirts and hoodies; jeans; no shoes. Hey wow! I didn't draw this! Carororo did, check out her art here. This is the first full-body picture I've obtained of him. A while back, a partial fursuit of a rabbit kind of ended up in my life, and I adopted him as a thing to have I guess. He's slowly developing into a personality, and is now pretty much my male 'me'. I'm terrible at drawing him, and only recently have I done up some pictures that are passable, which I'll be uploading in a sec.